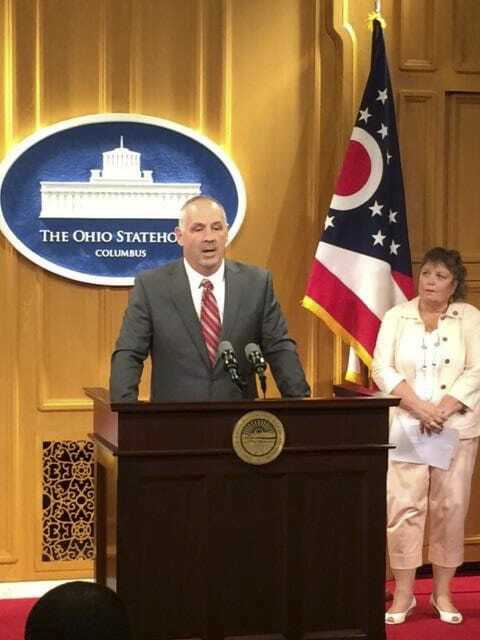 COLUMBUS, Ohio — State Representatives Cheryl Grossman (R-Grove City) and Stephen Huffman (R-Tipp City) discussed upcoming legislation they will introduce to upgrade Ohio’s statewide trauma system through the creation of the Ohio Trauma Board. The two legislators held a press conference Wednesday morning at the Statehouse to explain the importance, and the components, of the legislation, which they plan to introduce. They were joined by Dr. Steve Steinberg, a trauma surgeon at The OSU Wexner Medical Center; Philip H. Cass, of the Central Ohio Trauma System; and Rick Frank, of the Ohio Hospital Association. Trauma is the leading cause of death for Ohioans between the ages of 1 and 44, according to Dr. Steinberg. Since 2001, the state’s trauma death rate has increased by 33 percent. One of the chief provisions of the bill is the creation of the Ohio Trauma Board, which would consist of 19 members that will be appointed by the Governor, Speaker of the House and President of the Senate. The Board would be tasked with operating the state trauma registry, seeking and distributing grants and developing a statewide system for improving the quality of trauma care and rehabilitation. The legislation also seeks to add new designation standards, such as participation in statewide and regional injury prevention and quality improvement activities and more timely data submissions to the registry.